Next to prayers for good health, prayers for a beautiful face, skin or body were quite popular. 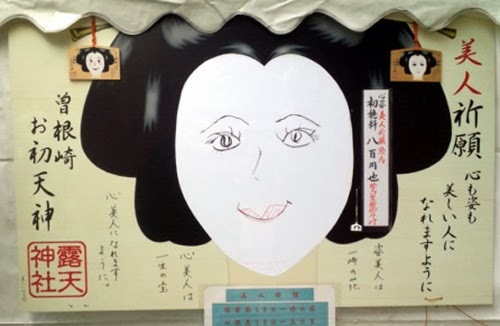 Ono no Komachi 小野 小町 was a famous poetess and beauty of the Heian period. 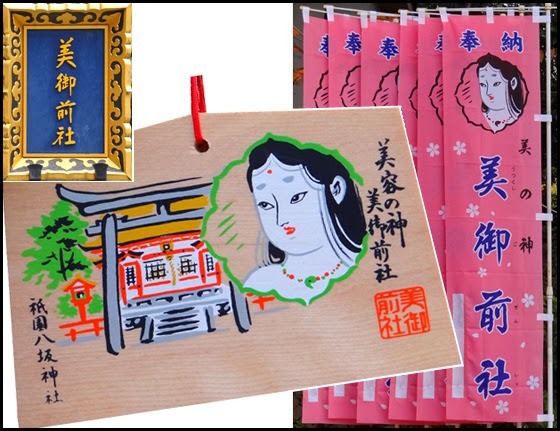 Ladies come to her temple to pray for beauty . . .
. Ono no Komachi 小野 小町 - Komachidera 小町寺 .
. biyoo jisha 美容寺社 praying for beauty .
. kami　髪　amulets for beautiful hair .
. Edo no bijin 江戸の美人 the beauties of Edo . To say prayers in front of them will bring beauty, beautiful skin and a beautiful heart to the person - like a spiritual "beauty liquid" 美容水 from the nearby well.
. LINK BIG font . 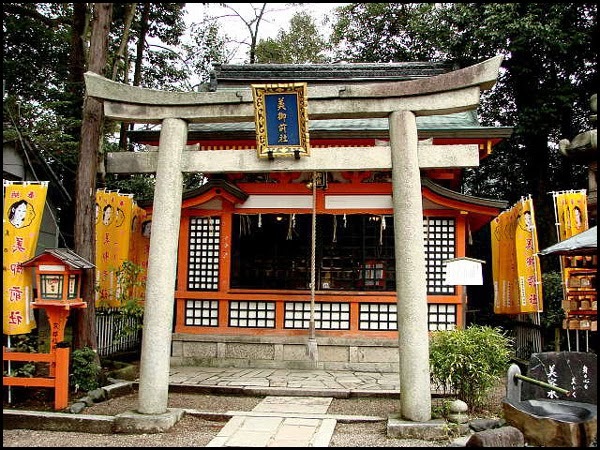 Standing on the east side of the main hall of Yasaka Shrine, the Utsukushi-gozen Shrine, is dedicated to three female deities of beauty: Ichikishima-hime-no-kami, Tagiri-hime-no-kami, and Tagitsu-hime-no-kami. 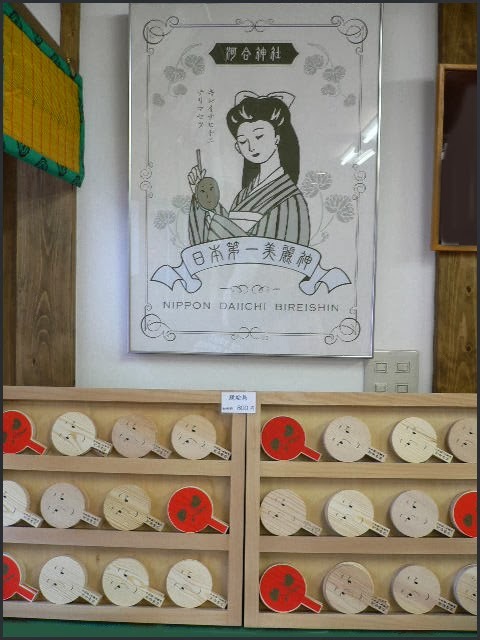 It is said that if you visit this shrine you will be blessed with beauty in both mind and body and it is well known that many young women, including the geisha and maiko, female Japanese dancers of Gion, come to visit the shrine. 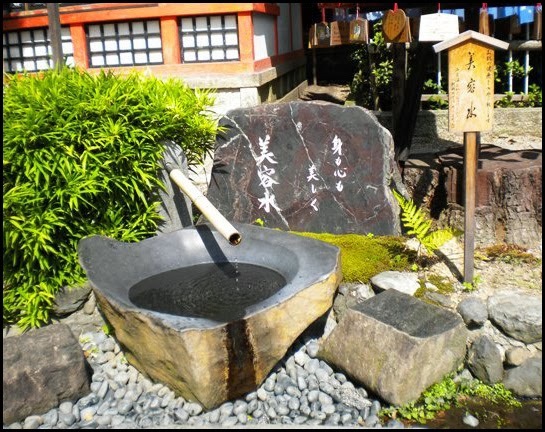 In addition, it is said that if you wash your hands and face with the "beauty water" from the spring on the grounds, your skin and heart will be beautified.
. Yasaka Jinja 八坂神社 Yasaka Shrine, Kyoto . 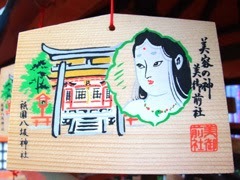 Sannyoshin 宗像三女神 (also written 胸形三女神), the "Three Female Kami of Munakata."
. 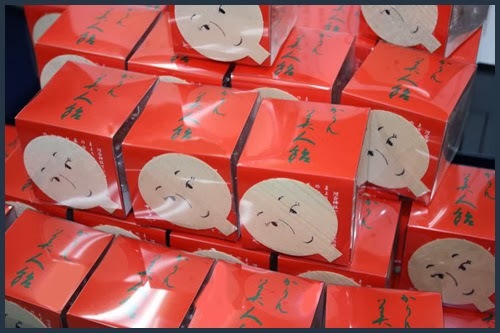 Ichikishimahime 市杵島姫 - 中津島姫命　Nakatsushima hime no mikoto . You can paint the part of your face that should improve its beauty. 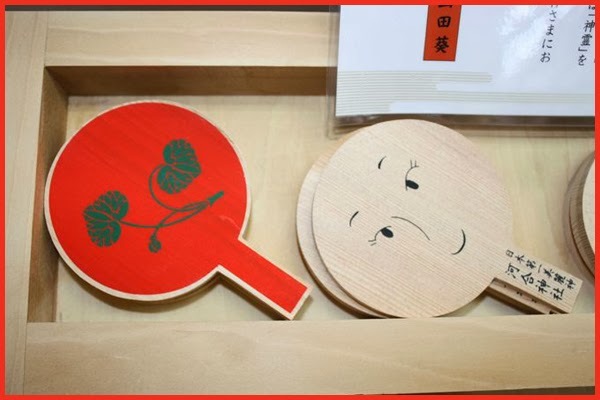 karin sui かりん水 beauty water to improve the facial beauty.
. . . Its main selling point is that the kami specialises in women’s beauty, and the ema votive tablets are accordingly shaped like a mirror. 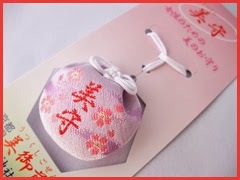 Female visitors are invited to draw their face on the front and write down a request to become more beautiful. 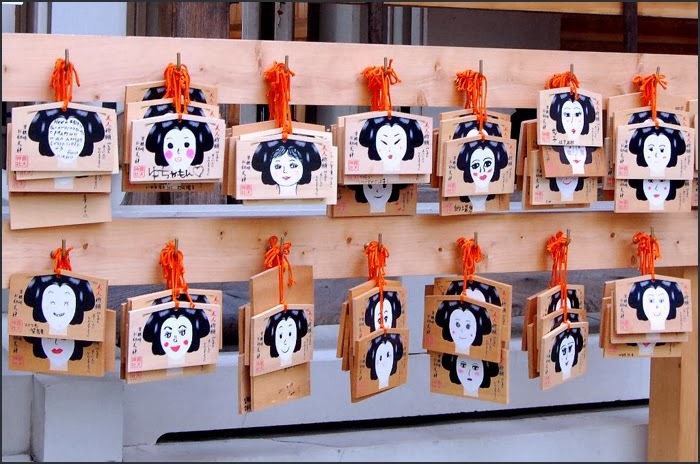 The ema are then displayed in front of the shrine. 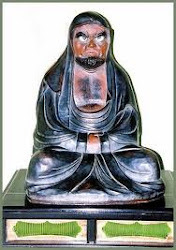 Kawai Jinja also celebrates its connection with Kamo no Chomei (1153-1216) . . .
. Sonezaki Shinju 曽根崎心中 The Love Suicides at Sonezaki . Look carefully for the White Rabbit of Inaba on the bottom.
. 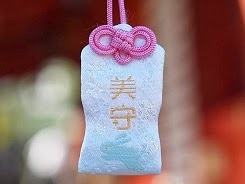 The White Rabbit of Inaba 因幡の白兎.
. Sennyuji, Mitera 御寺 泉涌寺 Mitera Sennyu-Ji, Kyoto . 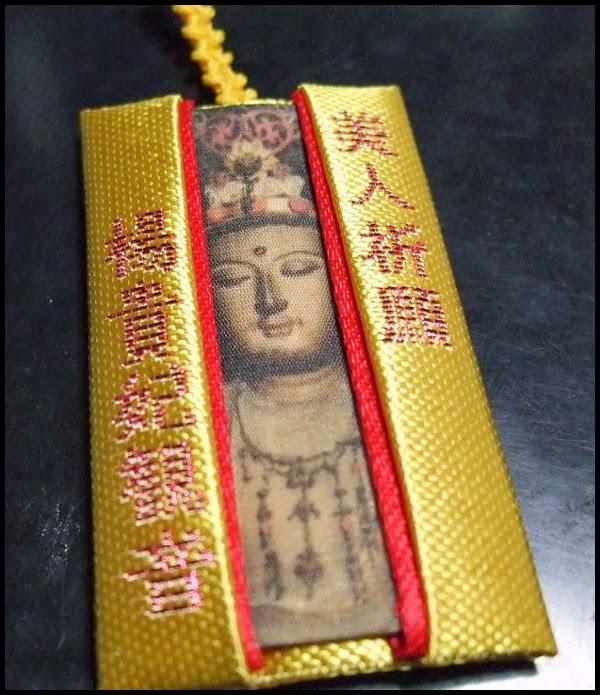 Yokihi Kannon is made of precious aromatic wood. The statue created by the order of Emperor Xuan Zong of the Tang dynasty of China, after the death of his beloved princess Yokihi. The precious wood for this statue seems to have been shipped from Japan to China, where the statue was made. 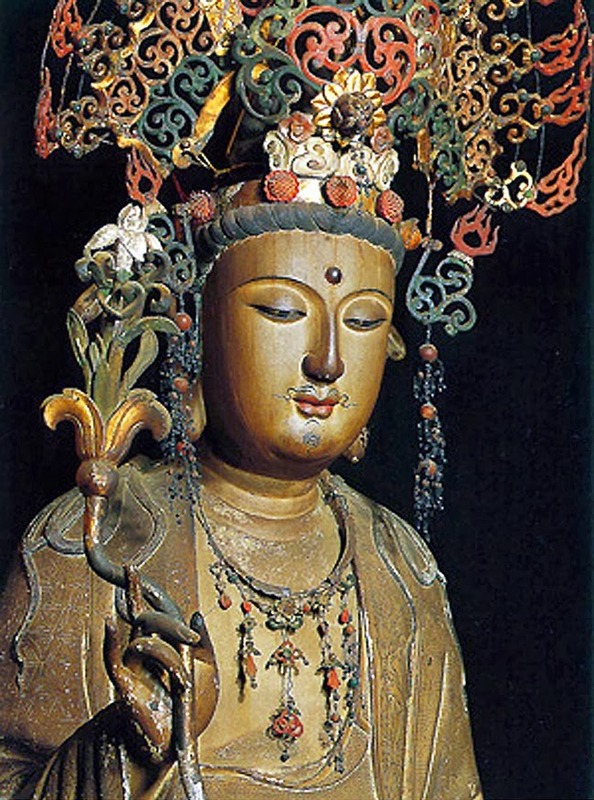 Kannon then came back to Japan, with the wish to protect the ships on their dangerous trip to and from China.
. Yookihi 楊貴妃 Yokihi - Princess Yang Gui Fei .
. Kannon Bosatsu 観音菩薩 .
. Toyotama Hime　豊玉姫 .